It is always an ideal case to keep your mobile devices charged up all the time when you are on the move. However, it doesn’t happen in real life with current technology in place. In view of this, Xantrex unveils a multiple mobile charging device known as XPower PowerSource Mobile Mini that provides charging capability to your mobile devices in normal and emergency use. Xantrex claimed it to be the first power device that can power up few devices simultaneously. 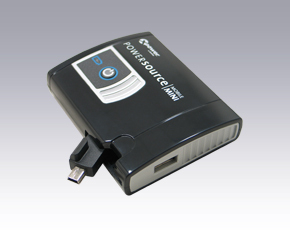 Powered by a Three Amp-hour Lithium-Ion rechargeable battery cell, it is able to charge up a wide range of popular mobile devices in the market such as ipod nano, BlackBerry, PSP, palmOne PDA and etc. With the weight of 120g, it features a mini USB pivot arm and an additional USB mini port that enable you to connect to separate external gadgets at the same time. In terms of safety requirement, it has internal safety protection circuitry that cut off the current when sensing over-temperature and over-loading conditions. Whenever the battery capacity is low, you can just connect back to the lightweight AC adapter for recharging at home. No doubt, the sleek and stylish Mobile Mini definitely can be a good companion that prevents your mobile devices from running out of juice.